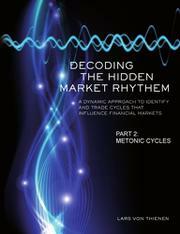 Von Thiensen’s (Decoding the Hidden Market Rhythm—Part 1, 2014, etc.) second installment in his series on stock market cycles looks to the stars for guidance. Believing, as some do, that the “financial markets are driven by emotions,” the author contends that if one can assess which emotions traders are collectively experiencing, one can predict (at least to some extent) and profit from the vagaries of the market. This is where heavenly bodies come in. Von Thiensen says, “There is growing evidence that the interactions between the Sun, Moon, and Earth are a factor that affects our well-being” and, by extension, our emotions. If the savvy investor is able to anticipate how these cycles will steer the emotions of other investors, they can potentially make a lot of money. By punching numbers into the author’s software (which uses built-in algorithms), the user can decode trading cycles and earn a decent profit, says Von Thiensen. He provides examples of his program’s success in an analysis from 2008 that shows that out of 22 trades, 17 led to gains. After all, “since financial markets are driven solely by emotions, it seems logical that this repetitive solar/lunar pattern must also be reflected in developments on the stock market.” It does seem like a logical enough assumption, but is it true? What of all of the other technical traders employing their own sophisticated, emotionless algorithms? Portions of the book engage in technical language (e.g. “we will use the wave to build a non-linear superposition wave based on the theory introduced on recurring energy patterns”); however, the content is still steered by astrology. The book certainly provides guidance for adventurous investors who are willing to put the author’s software to the test. Those readers already firm in their strategies seem unlikely, however, to convert to a computer model that is based on “how energy will influence the mood of investors.” As trading methods become ever more technologically sophisticated, banking on the mood of investors may seem like a risky proposition. The book outlines an intriguing strategy though its fundamental assumptions require careful scrutiny.